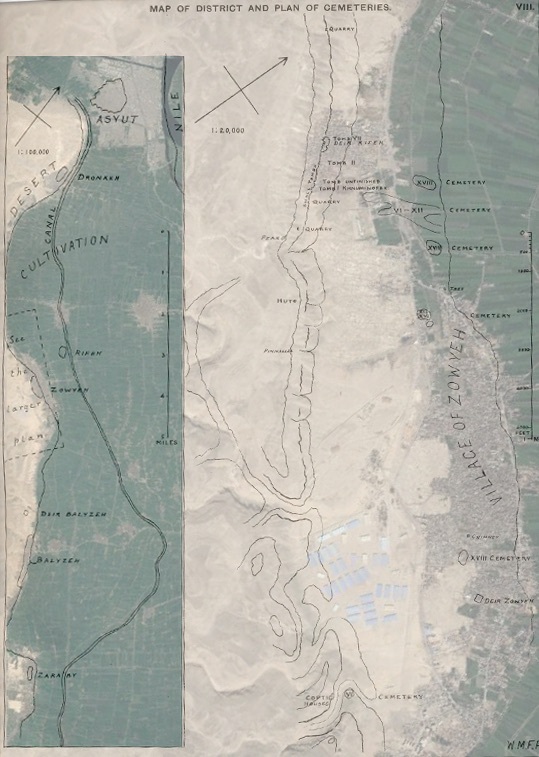 This series of cemeteries and tombs are located on the west bank of the Nile. Especially notable are the rock-cut tombs of local governors from the Middle Kingdom. The most important tomb is a large undecorated tomb of three chambers, with three burial pits. A number of smaller tombs were also found in the same area. Most of these tombs were plundered in antiquity, although the tomb of the two brothers Nekht-Ankh and Khnum-Nakht was excavated by Petrie and discovered intact. Griffith, F. L. 1889. The inscriptions of Siût and Dêr Rîfeh. London: Trübner. Murray, Margaret Alice 1910. The tomb of two brothers. Manchester : Sherratt & Hughes.